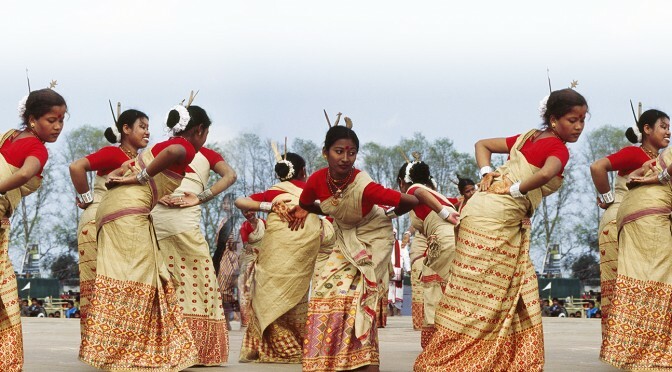 Assam is a land of rich cultural heritage.The features of offering Tamulpan (betel nuts with betel leaves), Horai (brass plate on a long stand) and Gamocha (a locally woven cloth) are three important symbolic elements which are unique to Assamese culture. The famous Vaishanav Movement, a 15th-century religio-cultural movement under the leadership of Srimanta Sankardeva, was the first renaissance of Assamese culture. A renewed hinduisation in local forms took place, which was initially greatly supported by the Koch and later by the Ahom Kingdoms. The resultant social institutions such as namghar (place of religious congregations) and satire (the Vaishnav monasteries) have become part of the Assamese way of life. The movement contributed greatly towards language, literature and performing and fine arts. However, the first renaissance of Assamese culture by Srimanta Sankardev could not stand the test of time, and as we enter into a new age the ethnic groups of Assam, who were sidelined from the mainstream for centuries with their culture, tradition and languages, have now awakened to their need of being recognized after aeons of suppression. The cultures, traditions and languages of the ethnic groups of Assam including the tea garden labourers, consisting of about one fourth of the population of Assam, will have to be respected and given its due recognition in Assam. These aborigines can be called the Adivasis. Shrii Shrii Anandamurtiji said Adivasis were Adi-asomias (the early Assamese) thriving to become asomias (Assamese). Shrii P.R.Sarkar, alias Shrii Shrii Anandamurtiji said that Sibsagar in central Assam is the cultural seat of Assam.The lingua franca of the Naga tribes is called 'Nagamese' which is actually a broken form of Assamese. This indicates the affinity of the Nagas with Assamese language and culture. He also said that the ethnic people had been culturally and economically exploited for more than seven thousand years by the upper dominant castes. That is why many followers of Shrii Shrii Anandamurtiji believe that a cultural university should be set up in Assam in Sibsagar or any other suitable place in Assam in order to develop the diverse cultures, traditions and languages of the various ethnic groups of Assam. The Assamese culture and language as of now is dominantly Aaryan which have culturally sidelined the ethnic groups who had been forced to revolt and form separate political states such as Meghalaya, Nagaland and Arunachal Pradesh from erstwhile Assam. Other ethnic groups in Assam are also in the mood of political separation from the mainstream.The solution to this complex problem must be addressed to by decentralised economic democracy for the ethnic people of Assam to allow themselves to develop themselves according to their own unique traditions and culture. The culture of the ethnic people are usally cooperative democracy. They are inborn with the skills of coperative survival in the adverse conditions they had struggled and lived through for centuries. They stood the test of time. We should now sow the seeds of a new cultural revolution in Assam in the real sense of the term. The unification of Assamese culture is now burning in every Assamese heart. The state anthem of Assam, India "O Mur Apunar Dex (অ’ মোৰ আপোনাৰ দেশ in Assamese)" written by Lakshminath Bezbaroa and attuned by Kamala Prasad Agarwala, was first published in 1909 in the Assamese magazine Bahi ("flute"). It was officially adopted as the Assam's state song in 1927 and is the most popular Assamese patriotic song of all time, and is a befitting tribute for unification of Assam. even if you scour through life. My heart hasn't been sated." This, we believe, will be the second renaissance of Assamese culture which is absolutely necessary and without which the development of Asomia Samaj is an impossibility.